Republican Donald Trump needs help paying for his US presidential campaign - and he's been asking foreign politicians to cough up. His efforts appear to be generating more anger than interest, however - and even if he did find a receptive audience overseas, any financial assistance he receives would be a violation of US law. Even the act of asking could get the Trump camp a rebuke from the US government. Members of parliament in the UK, Iceland, Canada and Australia have reported that they are being inundated on their official government emails accounts with fund-raising pleas from the Trump campaign - some from the candidate himself and others from his sons. 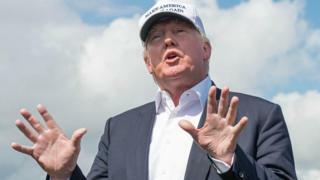 One pitch praised British voters for voting to leave the European Union, heralding that they had "taken their country back" - a line Mr Trump himself used while talking to the press at one of his golf courses in Scotland. On Tuesday Conservative MP Sir Roger Gale took to the floor of the House of Commons to complain about what he called "intemperate spam" from the Republican standard-bearer. MP Natalie McGarry tweeted a copy of an email signed by one of Donald Trump's sons and offered her own, sharper reply. "Given his rhetoric on migrants, refugees and immigration, it seems quite extraordinary that he would be asking foreign nationals for money; especially people who view his dangerous divisiveness with horror," she wrote. At least three Icelandic politicians have received emails condemning "crooked" Hillary Clinton and pledging to match any contributions to his campaign, according to Iceland Monitor. Australian MP Tim Watts tweets that he has received at least four emails since Friday. US law prohibits a political campaign from "knowingly" soliciting or accepting donations from foreign nationals. On Wednesday two US public interest groups announced they were filing a formal complaint with the Federal Elections Commission - which oversees US election law. "The FEC needs to investigate how many of these illegal solicitations were sent, to whom they were sent, whether any illegal foreign contributions have been received and, if so, whether the contributions have been returned," Democracy 21 president Fred Wertheimer said in a press release announcing the complaint filed in co-operation with the Campaign Legal Center. The groups allege that the Trump campaign should have been aware that there were foreign nationals on its email list - and that it continued to send such emails even after the media began reporting on instances of such solicitations. They contend that the FEC should "impose appreciate sanctions" (ie fines) on the Trump campaign and ensure that it avoids future violations. We need your help! Our opponent is (lying/cheating/surging)! Send us your money or political doomsday will be upon us! It's a game the Donald Trump campaign has only recently begun playing, however. The New York billionaire relied heavily on free media coverage and personal loans over the course of his successful Republican primary campaign and often boasted of how he was not reliant on traditional campaign contributions. The prospect of a match-up with Democrat Hillary Clinton, who has around $42m (£32m) in her campaign war chest, has led the Trump camp to change strategy, however. The presumptive nominee recently has held high-dollar fundraisers and sent out a flurry of emails asking for donations. The foreign missives (which are likely the result of poorly culled lists and not a ham-handed attempt to violate US law) indicate that the gears of the newly instituted Trump money-generating machine are grinding unevenly. The Trump campaign did not immediately respond to BBC requests for a comment. Fund-raising email lists are among a political campaign's most prized possession. They powered Barack Obama to victory in 2008 and fuelled Bernie Sanders's surprisingly persistent Democratic primary challenge to Mrs Clinton earlier this year. A well-crafted pitch sent to millions of followers can fill campaign coffers with money that can be directly used by the campaign (as opposed to big-dollar donations to supposedly "unaffiliated" political committees). The Trump campaign reports that its efforts have brought in $11m in "just a few days". But it also seems to have generated some embarrassing press along the way.